As you drive around the county over the summer months you will see young children in different GAA Pitches all wearing the latest Kelloggs Cul Camp clothing and taking part in fun games, matches and what looks like general mayhem to the casual observer with children of all ages both boys and girls mixed running around small sided pitches either kicking a football ball or striking a sliothar, playing bull dog or follow the leader and countless other games and activities under the watchful eyes of young coaches. 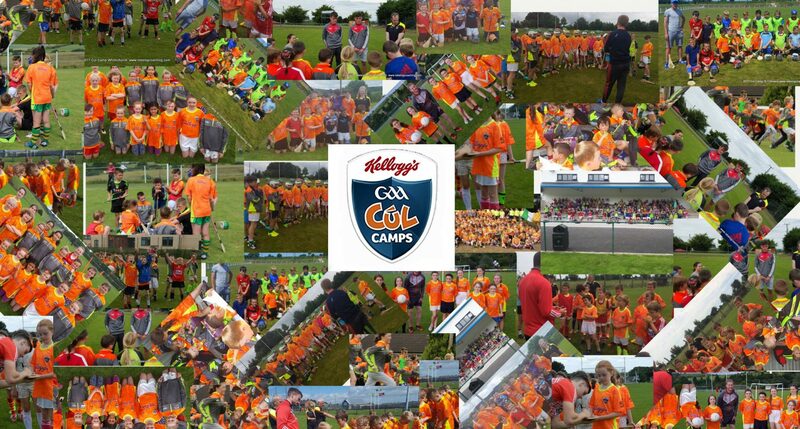 Well it’s that time of year again, school holidays have started, better weather is forecast and your local GAA Club is running the long awaited Kelloggs Cul Camp. The Kelloggs Cul Camps have been running for some years now and each year sees a steady increase in numbers at these camps and this year is proving no exception to that rule. Here we will post photos from the different Cul Camps around the county, photos are taken by people at the camps, from club twitter and facebook accounts, photos have been sent to us and of course photos from our own GDA’s who visit all the camps, if you wish to have your club photos posted here contact us or send them on to us and we will gladly post them. If you wish to have any photos removed please contact us and we will take them down. These photos only represent a snapshot of all the hard work going on in clubs around Cork.